Yikes it's a cliff hanger! Ok reason why this was a two page week. Yep my little sister who I don't have a good code name for yet got married this week to a young man who I still don't have a code for ether. So that's why this week is cut short because I spent at lest one day moving everything around for a reception in our house and a day for the wedding and a day sleeping because I am TIRED!! So happy day for them sleepy day for me! But there is still a new Holiday page up under the Holiday tab! Congratulations on little sister. That just leaves, nothing, I said nothing. I can see why you needed a day of sleep after that. I will be off work all next week...at least if I get everything caught up I will be. And don't worry about trying to update on Christmas next week. You can be late for that. You...didn't.... THE CAT. Oh, this is not good. Fun fact, the smell of death is how vampires were once described. Before Bram Stoker romanticized the hell out of Dracula, vampires were typically described as filthy rotting ambulatory corpses. This during a time when bathing was not a regular thing for common people, so that's a thing. This is going to be Tirea's test right here. If she's going to walk with these two, she's going to have to learn real quick how to deal with VERY BAD on a regular basis. If she bolts here, it's not going to be a good start. Arua looks like I'm going to be next week: wrapped up and staying inside. OF COURSE, Tirea gets a toy(?) cannon. I can't tell is Veja is amused by his gift, or trying to figure out how to open it. He's practically a rogue, opening boxes should be play for him. 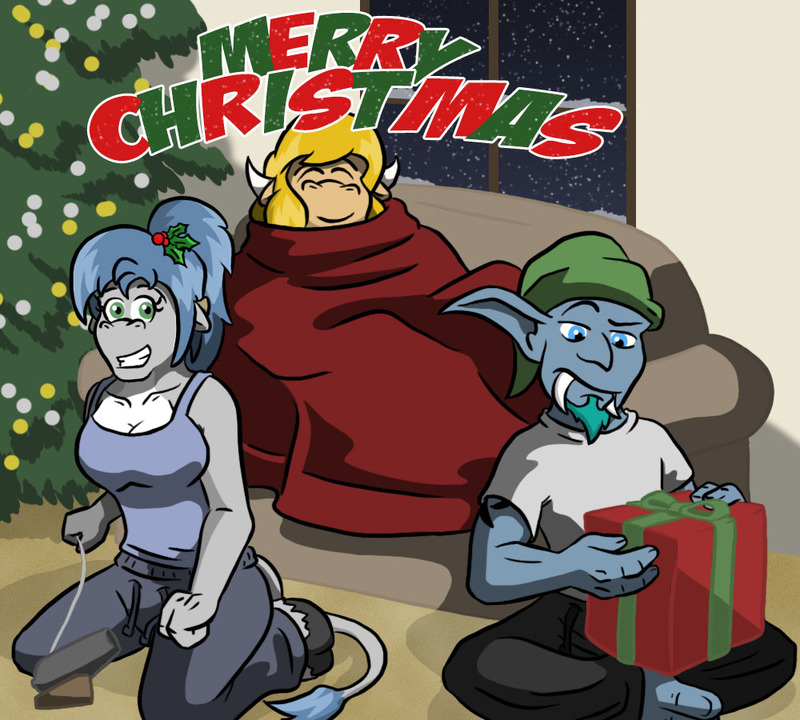 This was last year's Christmas card, but the character is retired so I can't make an updated one.